Pet obesity is a real problem. Studies have shown that while American’s waistlines have expanded, our pets have become plumper too. Obesity can shorten your pet’s lifespan and cause all kinds of medical problems neither you or your pet want. Obesity is of extra concern when it comes to Dachshunds. Dachshunds are notorious for developing back problems. One factor that can lead to such problems is genetic and largely out of our control. The rest of the factors we DO control. 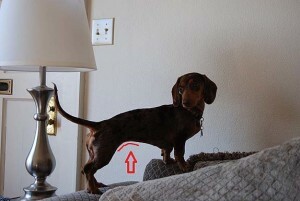 I think every Dachshund owner knows to stop or reduce their dog’s jumping. 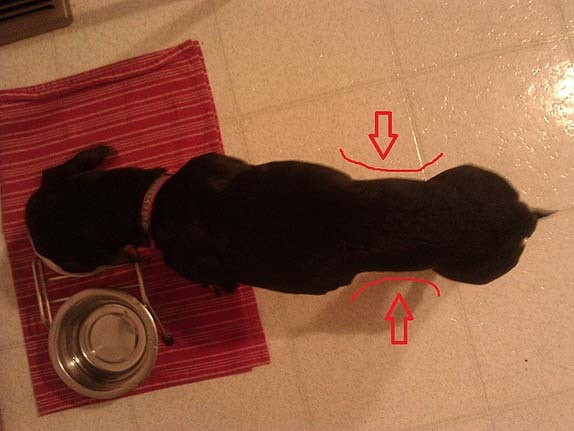 I think that many Dachshund owners don’t know that their dog’s weight plays a big role in helping or preventing back issues. Technically, I think they do know but they don’t know what an overweight dachshund looks like and therefore don’t recognize when their dog could stand to loose a few pounds. I don’t blame them really. Unlike humans, I find that many people find chubby pets “cute”. The “sausage dog” nickname implies that Dachshunds should be long and round. I have seen an increase of Dachshunds being used in advertising and most of them are at least a few pounds overweight. Chester was 8 when I adopted Gretel. I thought he was a good looking dog. I took pride in watching his diet and exercising him regularly. It was only when I took Gretel to her first vet visit and looked at the “healthy pet weight chart” on the wall did I realize that he was overweight. Curious, I asked the vet and he said that ideally a Dachshund will have a tucked abdomen and you will able able to see their ribs just a little. Poor Chester didn’t even see it coming. I immediately reduced his food portions and switched to a lower calorie food. After 6 months he was looking like a real stud and had lost almost 3 lbs. I work hard to keep Chester and Gretel at an ideal weight. You would be surprised though how many times I have heard the question, “what is wrong with them? They are so skinny.” A good rest of the time I get asked how I keep them so trim. If your answer is yes, my lovey could stand to loose a few pounds, then you should explore one of the blog hops below (a hop is a place that lists a bunch of related posts by other dog bloggers). This post is part of the show off your dog’s waistline blog hop. You can visit the hop and check out all of the other pet owners who have faced this challenge and learn from them. This post is also part of the Fit Dog Friday hop. I encourage you to visit that hop to see inspirational stories and join a community of proactive pet owners and healthy pets. If you are ready to get up, start moving and make a difference in you and your pet’s health today you can calculate how many calories you burn walking your dog (you can estimate what your dog would burn too). Love your new site and so glad you joined our Hop. Great tips here, especially for your dachshunds. We’ve been following the weight loss journey of Obie on our FB page…poor guy weighed 79lbs! He’s down to 37 now. Glad you are joining our fight on pet obesity! Education is the key. We’ve been following Obie from day 1. His is from or state and the rescue I adopted Gretel from was asked to take him but couldn’t. It’s amazing that he has lost so much weight. As your post today points out though – it’s not rocket science. Like people, calories in have to be less than calories out. What a trim waistline! Thank you for taking part in the campaign! Thanks for hosting. It’s an issue near and dear to my heart. This has been on my radar for a while but I had to wait until my new blog design was finished. I feel the same way Bethany. For me, the awkward moment is after they admire my slim doggies and they say “I just can’t say no to those sad little eyes”. Ack! Hand those people a carrot!! I see so many overweight dogs. When my dogs were heavier I didn’t realize just how big they were. Now that they’ve lost all their weight I hear people say, “They look great!” My vet says we’ve given them each an extra two to three years of life. That’s music to my ears. It’s amazing how a little bit of weight (but really 1lb of extra is like 40 to a human) can make such a big difference. Sawyer has packed on a few pounds, so this was a good read. Thanks for the resources, too! Not sure why he has plumped up, he eats the same thing as the other dogs and gets plenty of exercise, too. We see the vet for check ups next month and will discuss with her. In addition, I’ve agonized over Bentley because I thought he was too skinny, especially in the show ring. The vet told me that he is just right from a weight perspective, so no more worries if his ribs show a little! I have a friend with two miniature dachshund from the same litter. They get the same food and exercise but one of them is plumping up. I suppose dogs have different metabolisms like people. A sudden weight gain can indicate a medical problem though. i hear cushings disease causes rapid weight gain. I’ve learned that a healthy weight for a Dachshund looks just the underside of “good shape”. On most dogs they recommend that you can feel their ribs. My vet said that in Dachshunds you should just see their ribcage sticking out. Just like people dogs have different metabolism’s. I have 3 wieners and the youngest eats just over a cup of food a day while the other 2 get 2/3 of a cup a day. All get same amount of exercise. I get people asking all the time why they are so skinny. People have forgotten what a healthy dog should look like. I own a pet grooming salon and use my snooth dachsie as an exampke tonshow my clients what thier pet should lime like. Awesome that you bringing this problem to the forefront. Keep having fun with your wieners. Yay! 4 paws up for a great waistline! Heavy people have more back issues too, not just us long and short dogs. Nothing better than being fit because we feel better and enjoy getting out and exercising so much! Beautiful job keeping fit and healthy. When Kelly started putting on a few extra pounds, we started dieting together and we both lost weight. She’s now at a perfect weight and has maintained it for several years. It’s so important, and she’s feeling fit at 11 years old! I recently experienced someone thinking of chubby pets as cute. One of the prospective adopters for my last foster decided not to adopt because the dog wasn’t chubby enough. I think your pup’s waistline looks great! I have seen so many morbidly obese dachsunds, it’s just ridiculous. Most of them had the back problems you mention and then some… I agree that people need to realize that it’s not cute. Thanks for the heads up Pam. I must have forgotten to update it from the temporary URL when the new blog went live. It’s fixed now. I am strident on keeping my Beagles’ weight in check – chowhounds that they are! Thanks for the reminders and visual cues. Sometimes people think my dogs are too thin, too. We have trouble keeping weight on our dogs…lol. Storm is so thin right now. Those puppies are sucking up all of her calories. First off, great new look you’ve got going! The comment I usually get with Charlie is, “are you starving him?” It seems like a fit dog is to skinny for alot of people! Yeah, my first thought was that Chester looks a tad too thin, but better that side than the other. However, I do hear you when you say he eats more than Gretel – as you’ll see from my entry, Sid and Jeffie are like this: I have to really watch Sid’s weight and I need to keep on top of stuffing food INTO Jeffie because he’s one of those ‘hollow legs’ dog and I struggle to keep weight on him. He eats a third again as much as Sid (and often leaves some) and yet look at him! Sid is just a tad over what he should be right now, to my mind, though the vet says he’s absolutely fine for a nine-year-old tripod – and he’s a greyhound vet who actually does the track vetting as well as running a general practice, so he sees a LOT of very, very fit greyhounds. It makes me very sad to see grossly overweight dogs. It’s easy to let the weight creep on to a dog who eats well and has the ‘wrong’ metabolism or a physical handicap, but we must be vigilant for their sakes. I appreciate your opinion but I would rather go with my vet’s recommendation because she has seen and felt my dogs in person. I take my dogs to the vet several times a year to consult and make sure I am doing the right thing. I have had several vets confirm that I am.